These duplex officers' quarters, of adobe brick construction, were completed in 1887 when Fort Robinson became a cavalry regimental headquarters. This structure has been restored by the Nebraska State Historical Society, and furnishings represent those of a typical Fort Robinson officer's home. A post Commander's wife, Mrs. James Biddle, wrote the quarters were provided with running water, the first she had seen during her army life; and the social life was comparable to any large city such as Boston or Washington. 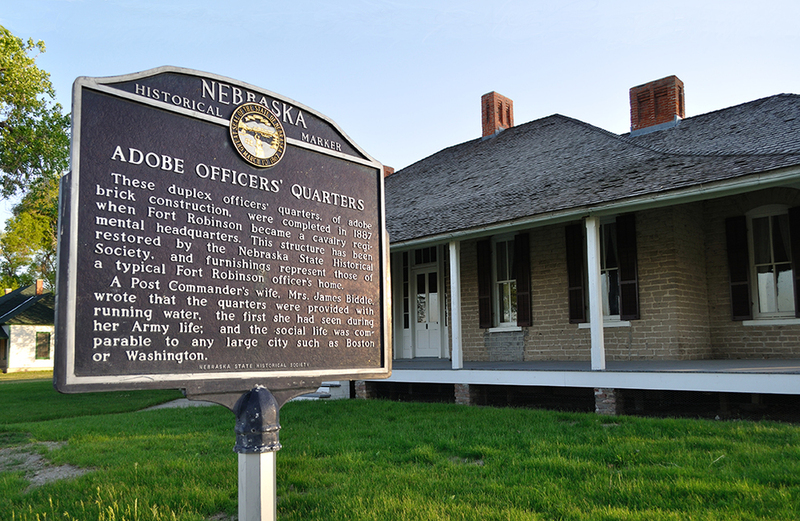 “Adobe Officers' Quarters,” Explore Nebraska History, accessed April 18, 2019, https://mynehistory.com/items/show/128.